Since we launched the site we have recieved a lot of positive response. adjusted on mentoring, the student quickly added. I signed up this morning and you are completely right..I’m so happy I did! I only had an hour on the court and tried the motion I saw you demonstrate to the Spanish player for him to get better pronation..you called it a twist serve..Well I tried it and my serve has never been as good:).Is a twist serve a slice serve? Would you please elucidade me on the best racquet position when we are in the power position.Should the strings be pointing at that time to the court or the edge of the racquet? at this point I’m trying to improve my racquet drop and not to have the racquet diagonal across my back but hanging on my left side(being left handed) and I have tried both power racquet positions but would be interested in knowing if biomechanically there is an advantage in any of the positions to get a lower racquet drop.. I guess I´m wandering if my elbow should be in a supinated supination at the power position or as I drop my racquet? I’ve taken into consideration the relaxed arm tip to get lower. I´m delighted with your site. 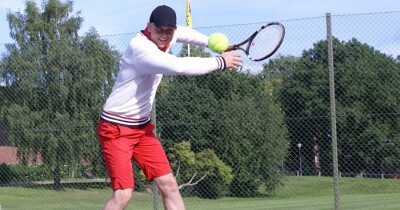 I´m very impressed with all the new stuff especially the forehand. As tennis coach and Nat’l ranked player i am very impressed with the simplicity with the teaching method and I would like to subscribe as a member. Many thanks from Coach Robert. to improve my backhand and serve too. Thanks. That is a great movie. Bravo on your great breakdown and on using the Professor. He gave the best explanation of pronation I have ever heard. I am a high school coach and I will have all my players watch that video. Thank you and Thanks for the great instruction videos. Yes, the ’48s video’ is marvellous. Not just that, all the videos are excellent and I can say that these videos are superior in teaching tennis techniques than many of the coaches here in the Middle East. I should have had discovered your web site a little earlier. Any way, thanks for the excellent work you have been doing. tried to hit like the big boys – never could quite do it – your forhand lesson showed me how to do it. I was just thinking about sending you an e-mail today. I signed up for your membership and have watched your world class forehand video and the Methodology video. I must say I spent 2 days watching and then I went out to try it. Today, I am finding that I have indeed improve my forehand ground stroke. It is still not where I wanted it to be, but at least I know where I need to improve and I will work hard at it. My biggest problem is the body rotation and the take back in the preparation stage. That is the hardest for me and I am wondering if with someone my age whether I can still get it and whether it is worth it for me to try those shots. I want to thank you for those lesson video and I want to let you know that I am glad that I sign up to be the member. I do not quite understand what the entire video would be – I love the simple few step instruction – do you have a course for the strokes that is similar to this as I do not have a lot of time – just want simple instructions like the one you have on the forehand. I really like the movie about the forehand thats called something with 48 seconds if i remember right. In general i really like the site and think i will learn really much about the serve, especially about the twisted one. Hello Frederic, after so positive feed backs above, please send me a few more free minute videos that I failed to view them when I received them a few moths ago. Hi Frederick how are you? First of all, I want to thank you for our amazing time in Aktea and everything you have helped me with. I am slowly getting into my own but I think that it will take more time to finish everything. This is my email address vladimirburian@hotmail.com and keep in touch. Ur friend Vladi. Great Site! Whay Haven´t my coaches told me this for 15 years ago!!! So angry at them now! I just had to write that! And Fredrik, you going a great job! Looking forward to more movies. Hello,Fredrik! I am grateful to you for the tips technique game.They help me improve the technique ctrikes.With respect Viktor.